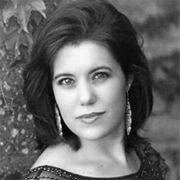 Adrienne recently relocated to the Shawnee area, after obtaining her Bachelor of Arts in Vocal Performance from Missouri Western State University. Her performances in musical theater and opera have received acclaim both nationally and internationally, including second place in the National Opera Association Competition and singing with the Manhattan Opera Studio in New York City. She has been playing the piano since she was very young, and enjoys everything from Debussy to Regina Spektor. Favorite past roles include Christine in Phantom, Stella in A Streetcar Named Desire, and Pamina in The Magic Flute.